Connee finally is back in the Decca recording studios and cuts four sides with the Sy Oliver Orchestra: “Somebody Stole My Darling,” “I Know What It Means to Be Lonesome,” “Begin The Beguine,” and “Believe It Beloved.” However, the voice that makes these recordings is substantially different sounding than her commercial recordings of just a few years before: there is a more raw, emotional edge which is coupled with a pronounced vibrato. 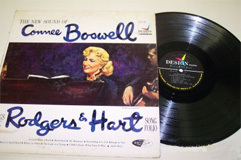 This is Connee Boswell, torch singer. 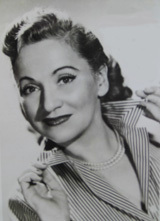 Connee is filmed in Hollywood for the Universal-International short subject, “Connee Boswell and Ada Leonard.” Ada leads her all-girl orchestra while Connee sings, “Come Rain, Come Shine.” She teams up with comedian Bob Hopkins, who impersonates Bing Crosby as he sings “Basin Street Blues” with Connee. Connee is back in Decca’s studios with the Lawson-Haggart Jazz Band, where she begins work on the “Singin’ the Blues” album. 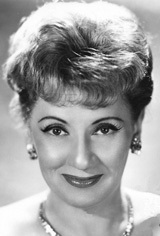 Work on the album continues in March of 1953 when she again records with Haggart and later, Paul Nielson’s Orchestra. The album, released in 1953, is Connee’s first, and was released on both EP 33 1/3RPM format and 45RPM. Connee is featured on a number of television programs, including “Friday with Garroway,” “The Perry Como Show,” “Chance of a Lifetime,” and others. She continues her personal appearances and occasional radio programs, including more transcription work for recruiting drives for the armed forces. Connee is filmed in her NYC apartment for a series of television shorts called Snayder Telescriptions. Much like the “Soundies” of the 1930’s and 40’s, these featurettes are like early music videos. 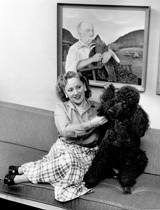 Her dog Rebel is featured along with her in some of these films. 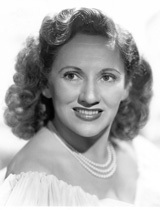 Connee records her last charted hit, “If I Give My Heart to You.” The song was a smash hit for Kitty Kallen but Boswell’s version rose to the #10 spot in September, 1954, and spent 11 weeks on the charts. Connee will continue making personal appearances and the occasional television guest spot. 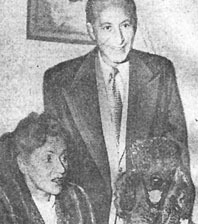 Connee and her husband Harry Leedy board a non-stop flight from Los Angeles to New York for a recording session. The American Airlines DC-7 makes a crash landing in Chicago due to an engine failure. During the emergency landing, Connee puts on an in-flight performance from her wheelchair to help calm everyone on board. She sang “Comin’ In on a Wing and a Prayer”. All 66 people on board escape any serious injury after the plane lost it’s nose gear and landed virtually tail up. Connee is praised for heroism by the media. Connee appears on Edward R Murrow’s “Person to Person” TV program. Vet and Martha go to see Connee perform at Jimmy Fazios Supper Club in Milwaukee. 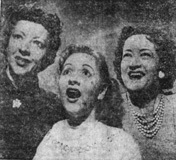 Connee persuades her sisters to join her onstage. After a couple of false starts they perform the song they would also start a show with for good luck: “Heebie Jeebies.” It was their last public appearance together. Connee is back in Decca’s recording studios in NYC with Sy Oliver and His Orchestra. The subsequent recordings are issued as her second album, simply named “Connee.” This is her last recording session with Decca records, ending a twenty-five year collaboration that had yielded many hit recordings. 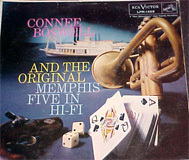 Connee is recording for RCA/Victor Records and collaborates with the Original Memphis Five. The group consisted of Jimmy Lytell, Billy Butterfield, Frank Signorelli, Miff Mole, Gene Traxler and Tony Spargo, with Boswell on vocals. The album is a mixture of instrumental and vocal arrangements and is considered by many jazz critics to be one of the finest jazz recordings of all-time. A highlight of the album is her rendition of “Gianina Mia,” where she once again borrows from the classics and creates a masterpiece, using multi-track recording to recreate the Boswell Sister sound. 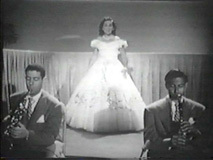 Connee and the Original Memphis Five appear together on the Ed Sullivan “Toast of the Town” television show. Connee is recording for Design Records in NYC. Together with a lineup of top-notch musicians, including Will Bradley, George Duvivier, Mundell Lowe and George Wettling, she crafts her “Connee Boswell Sings Irving Berlin” album. The album was recorded direct to two-track and heralds her first stereophonic album. 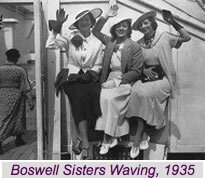 Connee’s sister Martha Boswell Lloyd dies in Peekskill, NY after a lengthy illness. Connee again is recording for Design and completes her last album, “Connee Boswell Sings the Rogers and Hart Songbook.” The album is promoted as the “New Sound of Connee Boswell.” Highlights of the album include a reflective and intimate Connee crooning “Where or When,” and a playful “Everything I’ve Got Belongs To You.” Even allowing for the early experimental efforts with stereo recording, it’s clear that there were many problems in the mastering and these appear in all of the subsequent issues of these sessions. 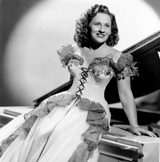 Connee is featured in the 13-episode series, “Pete Kelly’s Blues.” She plays Savannah, the saloon singer..
Connee appears on the television program, “A Night of Music,” on the Bell Telephone Hour. She sings while her old friend Red Nichols and His Five Pennies, play.